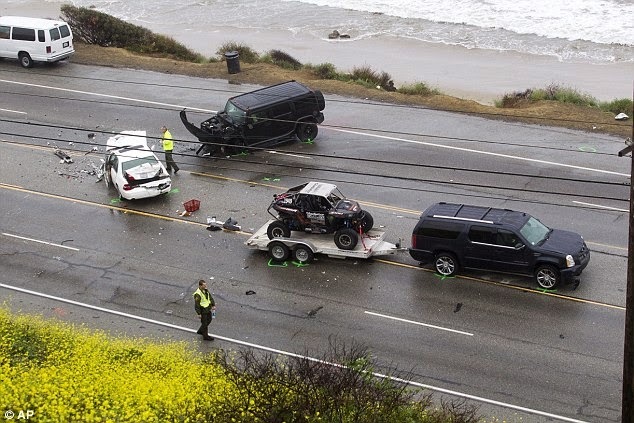 Bruce Jenner is currently facing possible manslaughter charges after a new video of his car crash incident showed he was the driver who rear-ended woman killed in car crash. According to TMZ, an MTA bus traveling behind the Hummer involved is reported to have captured the entire incident on mounted cameras, and the evidence is now in the hands of the police. both the late victim’s white Lexus and the Toyota Prius involved. Most significantly the video shows that the Lexus driver didn’t make contact with the Prius involved. If correct, the MTA video makes a more compelling case that Jenner was following too close, which opens the door to a possible vehicular manslaughter prosecution. Detectives in Malibu have opened a vehicular homicide investigation. If any of the drivers in the crash are found criminally negligent, felony charges could be filed - which carry a sentence of up to six years in prison. If it is determined that Jenner's Escalade struck both cars and authorities find he was following too closely, it would make prosecution for vehicular manslaughter more likely than if he was just part of the chain reaction.